Electric vehicle drivers using the UK’s motorway system can now access 13 more rapid chargers at Welcome Break service stations. Installed at Welcome Break sites across the country, the 13 rapid chargers represent the latest phase of work completed by Nissan and Ecotricity to expand the rapid charging network on the UK’s motorways. Taking into account the existing infrastructure installed under the partnership earlier this year, there are now 16 rapid chargers available at Welcome Break service stations on the motorway, with plans to install at the majority of Welcome Break sites by April 2014. The new additions mean the total number of rapid chargers in the UK is now 97. The chargers form the UK’s first publicly accessible rapid charging network on the motorway and are capable of ‘refuelling’ an all-electric Nissan LEAF from 0 to 80 per cent battery capacity in just 30 minutes. Safe in the knowledge that there are Welcome Break service stations up and down the country equipped with rapid charging technology, EV users can now explore opportunities to take longer journeys using the UK’s motorway system. Jim Wright, managing director of Nissan GB, said:“Nissan is working hard to ensure that 100% electric driving becomes accessible for all UK motorists and the installation of a rapid charging network on the motorway opens up EV ownership to thousands more motorists. 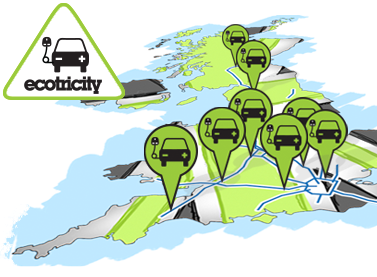 Ecotricity founder, Dale Vince added: “The main barrier in people’s mind to the take up of electric cars is their travel range and charging times. Nissan is leading the way in developing electric vehicle charging infrastructure, and the new rapid charging network at Welcome Break service stations is part of a long-term plan to install more than 150 rapid chargers across the UK by April 2014. Since 2011, 97 rapid chargers have been installed across the UK with Nissan as the driving force. In July, Nissan launched the next generation LEAF, packed with over 100 improvements including increased driving range and quicker charging times. Keen to give motorists maximum choice, Nissan offers the model in three distinctive trim levels as well as a variety of flexible finance packages such as a battery leasingoption.